For college courses in Composition and Rhetoric. 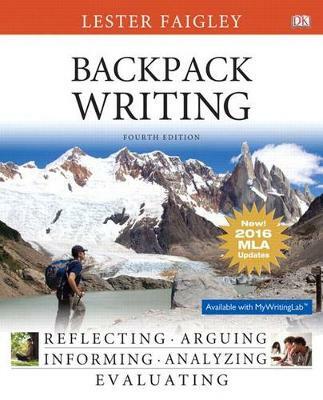 Revealing the writing process through interactive learning Backpack Writing, 4th Edition presents writing, reading, and research processes dynamically, using a variety of visuals to illustrate how readers interact with texts and how writers compose. One of the first textbook authors to focus on multimedia composing, Lester Faigley employs his own advice to engage individuals in every step of the writing process--for everyday life--and pulls back the curtain on how writers work. Backpack Writing gives individuals the support they need to succeed in their careers. * The 8th Editionintroduces sweeping changes to thephilosophy and details of MLA works cited entries. Responding to the increasing mobility of texts, MLA now encourages writers to focus on the process of crafting the citation, beginning with the same questions for any source. These changes, then, align with current best practices in the teaching of writing which privilege inquiry and critical thinking over rote recall and rule-following."